WASHINGTON (CNN) -- The effort to delay next month's scheduled death of analog television suffered a setback in Congress on Wednesday, despite warnings that millions of American homes will not be able to see broadcast shows in three weeks. Will the end of analog television come in February, or sometime later? The answer is now up in the air. The bill, which passed the Senate unanimously Monday, failed to get the necessary two-thirds vote in the House on Wednesday afternoon. It was not immediately known whether or when another vote might be taken in the House. Unless Congress acts quickly, older televisions won't pick up TV broadcasts without a digital converter after February 17. The switch will not affect cable or satellite subscribers. The transition to digital-only broadcasts has been set for nearly a decade, but 6.5 million households, mostly lower-income, have not bought the newer digital TVs or converters for their old sets, according to a study by the Nielsen Co. In January, the incoming Obama administration urged Congress to extend the date because the switch "has not been adequately funded." "There is insufficient support for the problems consumers (particularly low income, rural and elderly Americans) will experience as a result of the analog signal cutoff," transition team Co-chairman John Podesta said in a news release. The bill, sponsored by Sen. John Rockefeller, D-West Virginia, would allow stations to keep their old transmitters turned on until June 12. Senators, worried about the static they'll see when the plug is pulled on analog television broadcasts in the United States, had approved the emergency measure Monday and rushed it to the House floor for a vote Tuesday afternoon. But representatives put off the vote until Wednesday. Two members of the Federal Communications Commission sent a letter to Rockefeller and Rep. Henry Waxman, chairman of the House Energy and Commerce Committee, this month "to express our deep concern" that the country is "nowhere near" ready for the signal switch. Commissioners Michael Copps and Jonathan Adelstein called for a delay to give the government more time to get "boots on the ground" to help with the transition. At least $200 million has been spent in recent years to explain to TV viewers how they need to prepare, but one key element of the federal government's transition plans hit a bottleneck in recent months. 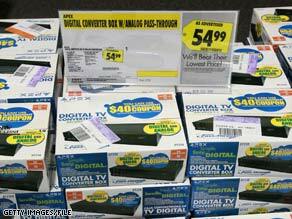 The FCC ran out of money in recent weeks for the $40 coupons to help people buy converters for their analog TVs. The new digital signals also don't reach some communities now served by the analog signals, the commissioners said. The FCC opened a call center just last week to help consumers prepare for the analog-to-digital switch. The four-month delay would come with a cost to local television stations. Keeping their old transmitters turned on would bring higher power bills and maintenance expenses.